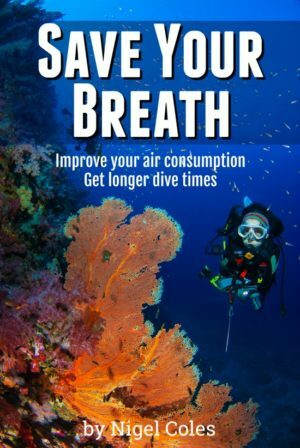 « Are lionfish safe to eat? Lionfish arrived in Grand Cayman in 2009 and it did not take long for local restaurants to start serving this sustainable choice of fish on their menus. 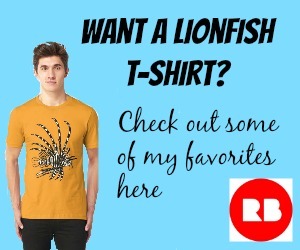 That’s because lionfish are absolutely delicious to eat. The white flaky meat is mild, delicate, tender and buttery. Restaurants love to have lionfish on their menu. 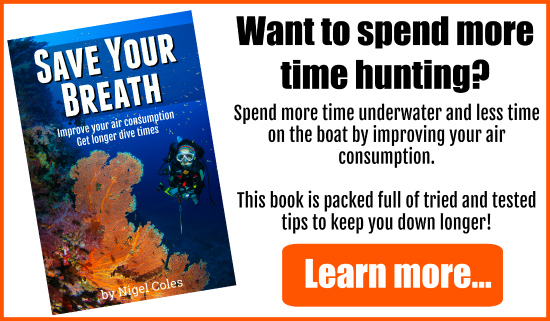 It’s abundantly available, and fresh off the divers spear TODAY. No need for ordering from overseas, or ordering it in big frozen packs, or even waiting for it to be ‘in season’. Diners have begun asking for lionfish by name and restaurateurs like to keep their diners happy. Restaurateurs can also educate their diners by letting them know that lionfish is a healthy choice of fish as they are shown to have a higher concentration of heart healthy Omega 3 fatty acids, they have lower levels of saturated fats and lower levels of heavy metals such as mercury. All round, its an excellent choice to include on a restaurant menu. Since September 2009 when we saw our first lionfish here on the East End of Grand Cayman I have caught in excess of 10,000 lionfish, weighing in excess of 5,000 lbs. 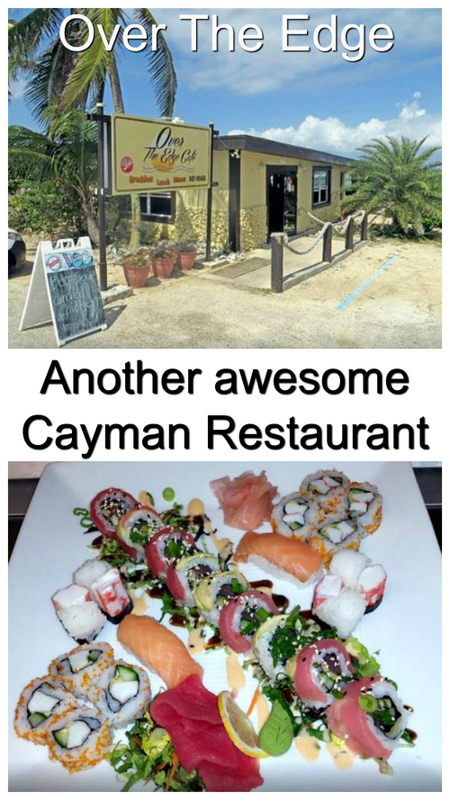 Tukka Restaurant & Bar, owned by Australian Chef Ron Hargrave and based on the East End of Grand Cayman. He also owns Eagle Rays Bar & Grill (see details below). 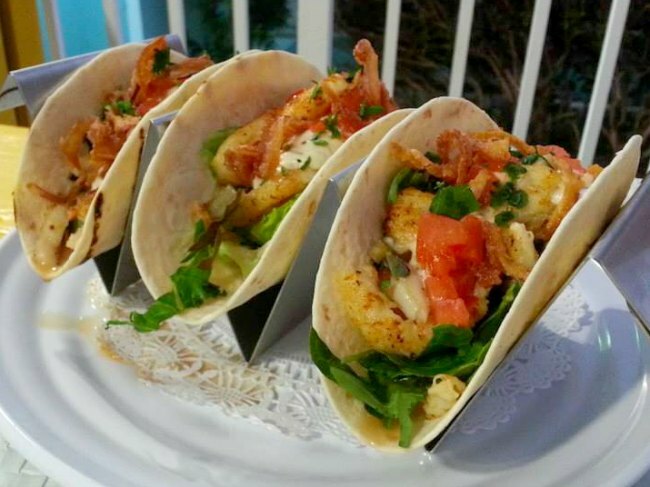 Lionfish at Tukka Restaurant is served in their famous and ever popular Tacos. Also don’t miss Fresh Fish Friday when they serve up Whole Fried and Fillet lionfish. Diners enjoying the food and view on the deck at Tukka. 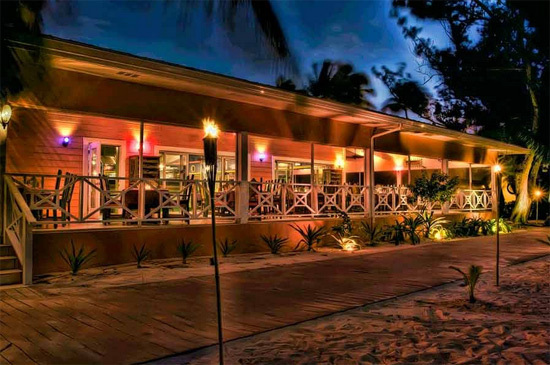 Rum Point Restaurant & Bar, managed by John Buckley (known as JB) and based at Rum Point near Kaibo. Lionfish at Rum Point Restaurant is served either as Ceviche, or filleted and then pan fried or blackened. As a wonderful benefit for those living or vacationing in the capital George Town (& Seven Mile Beach) diners can get a free Red Sail Sports catamaran from Safe Haven on Seven Mile Beach to Rum Point Restaurant and back. Makes a lovely evening out into something special. 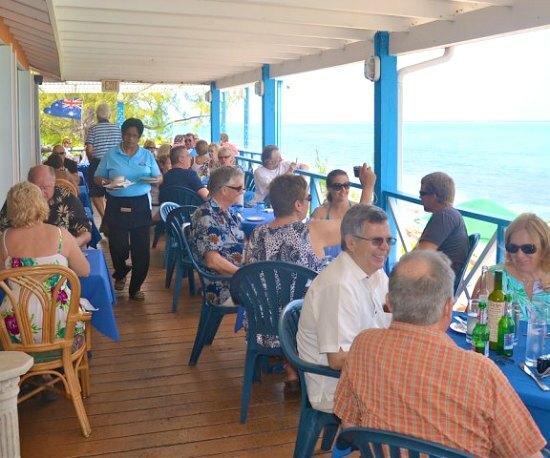 Rum Point restaurant. A great evening venue on the beach front. 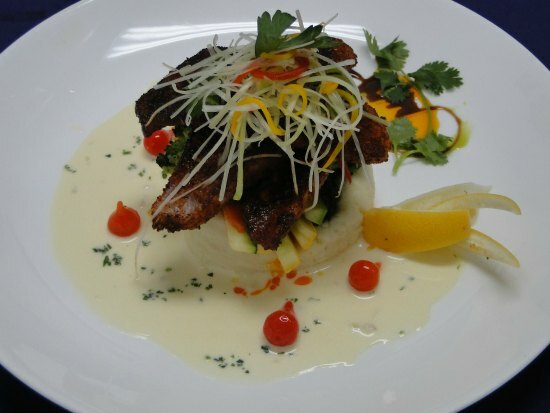 Rum Point blackened filleted lionfish entree, served with garlic mashed potatoes,daily vegetables, lemon butter cream sauce, accented with Peruvian pickled peppers, garnished with a Julienne of bell peppers, leeks and cilantro sprigs. 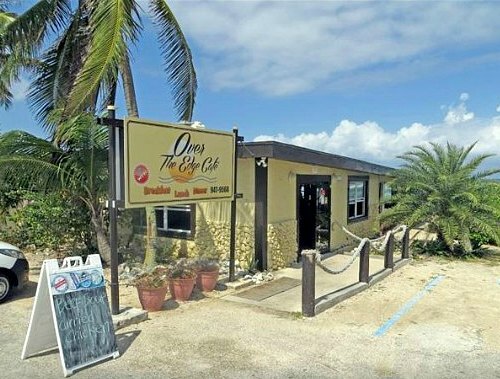 Over The Edge Cafe is based on North Side, on the way to Rum Point. 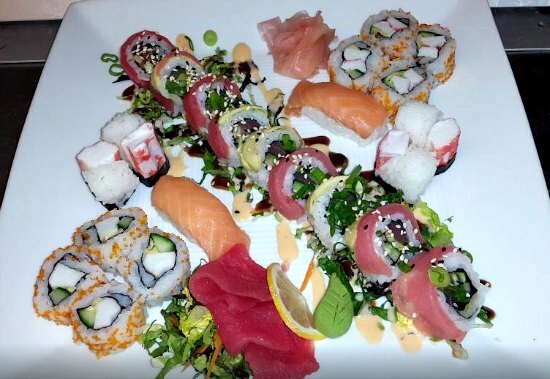 Lionfish at Over The Edge is served as Butterfly pan fried, deep fried and also as sushi on their very popular Sushi Sunday night. 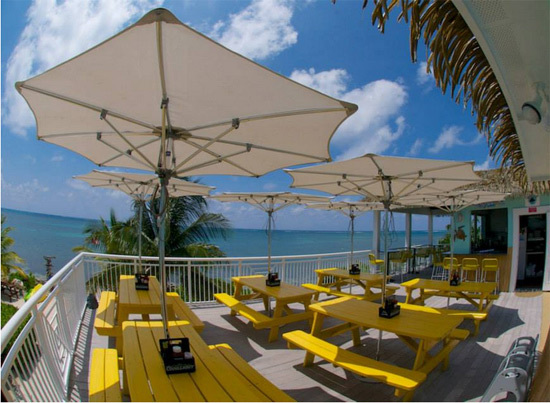 Eagle Rays Bar & Grill is based on the East End of Grand Cayman. 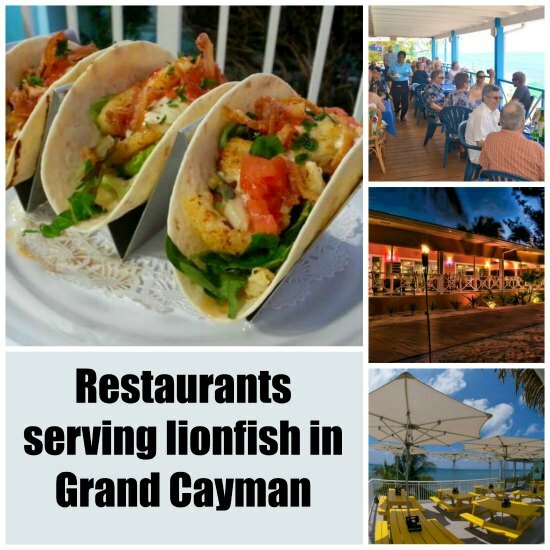 Lionfish at Eagle Rays Bar & Grill is served as Ceviche, their famous and ever popular Taco’s or as a fish burger. Lionfish tacos served at Tukka and Eagle Rays. Join them for the early bird special pricing.